The Oncology Institute of Hope Innovation welcome Dr. Ali to their team of specialist. The Oncology Institute of Hope Innovation welcome Dr. Ali to their team of specialist. Dr. Sami Ali is a well versed and compassionate doctor who believes strongly in providing only the best care to his patients and their families. Dr. Ali began his medical education in 2007 at the American University of the Caribbean in Cupecoy, Netherlands Antilles and then moved to New York where he finished his medical degree at Memorial Sloan- Kettering Cancer Center, New York, New York in 2013. 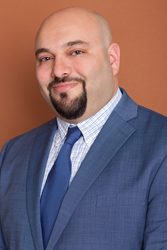 Dr. Ali completed both his residency and fellowship at the New York Presbyterian, Brooklyn Methodist Hospital, Weil Cornell Medical College. He completed his residency in PGY-3 and his fellowship in Hematology and Oncology. In November 2001, Dr. Ali was named Intern of the Month at the NY Methodist Hospital. Dr. Ali received the CDI Documentation award in 2012, 2013, and 2014. Dr. Ali has multiple publications and abstracts including: Difference Between Right versus Left-sided Colon Cancers; Analysis of Clinical Features, Histopathology and Stage to Stage Prognosis, Gastrointestinal Cancers Symposium, Renal Medullary Carcinoma- Case Report and Review of Literature Case Reports in Oncology, Cataloguing Depression Among Cancer Patients by Age and Stage of Malignancy Type: Psycho-oncology ESMO Abstract 912, Anemia in Diabetic Patients without Underlying Nephropathy, A Retrospective Cohort Study. Dr. Ali loves to travel and has enjoyed living in different countries and different parts of the United States. He likes to watch sports and enjoys the outdoors. He is very active in the community. Dr. Ali understands the importance of giving the best individual care to each of his patients. He strives to educate and communicate efficiently with his patients and their families. He enjoys getting to know his patients and their families and remains active in research and clinical studies.